Today I received a new item for the arsenal and I hope it’ll drop about a full pound off my pack. When I was at the Buck Lake hang I had a chance to try a Switchback hammock. Last week I ordered a smaller and lighter version known as the Light Hiker. It’s spec’d out at 24 oz unrigged. On my scale it came in at 32.7 oz inside the bishop bag and this included caribiners and straps. My Hennessy is 43.8 for a total current savings of 11.1 oz. The hammock arrives in a bishop bag with whoopieslings. 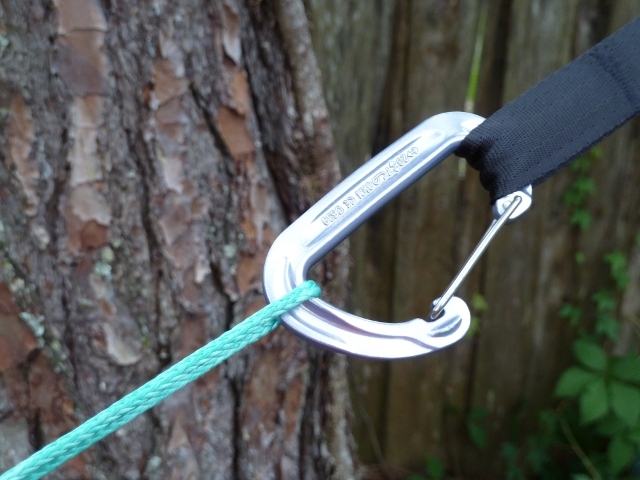 I have two 6′ tree straps for mine but they’re polyester and I’ll be making some longer ones from polypro webbing. Setup was incredibly fast at just under 5 minutes and I’d never seen one before. 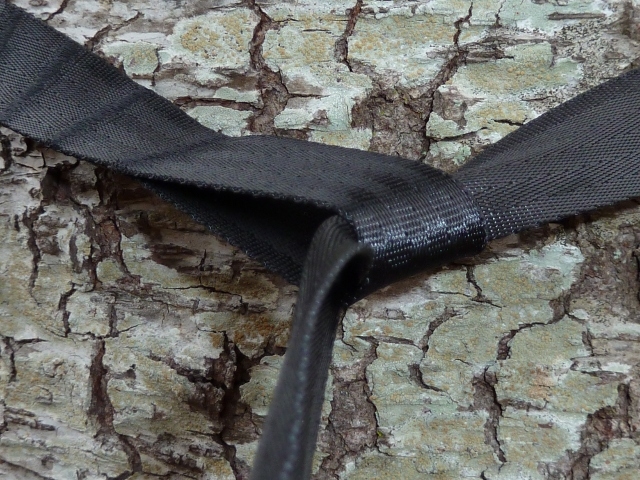 I simply wrapped one strap around the tree running it through the other loop and put a carabiner on the other loop. 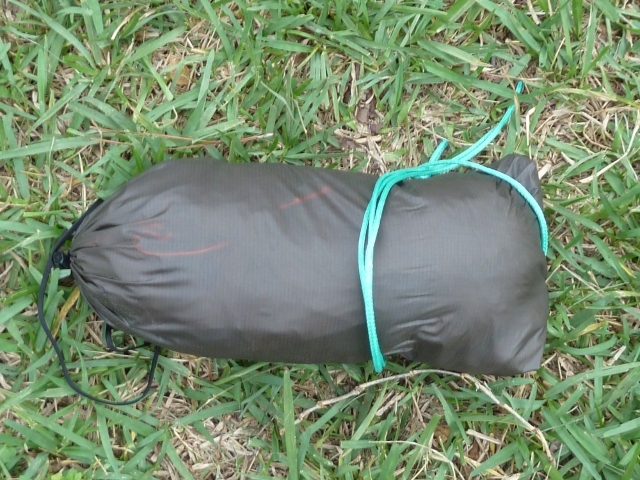 I attached the whoopie to the biner and grabbed the other whoopie pulling the hammock out of the bag along with it. Then it was just a matter of repeating the process with the strap and biner on the other end. I haven’t had much time to play with it but my initial impression is very positive. I have to admit that it is so much nicer, so, so much nicer sitting down and swinging my legs into hammock instead of doing the bottom entry. 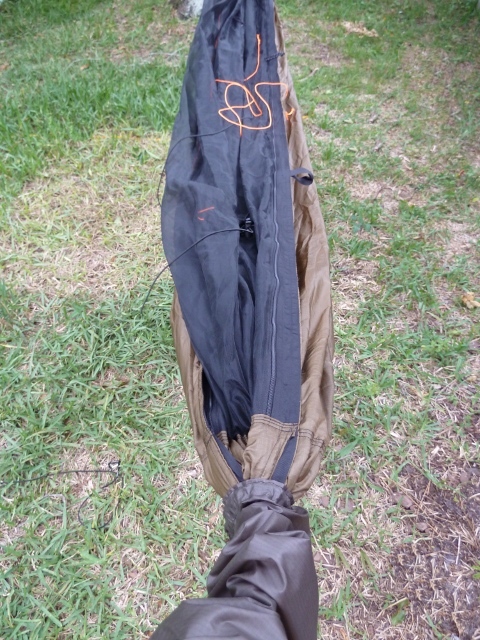 The Light Hiker has bug netting that can be quickly and easily moved out of the way by unzipping the two full-length zippers on either side. 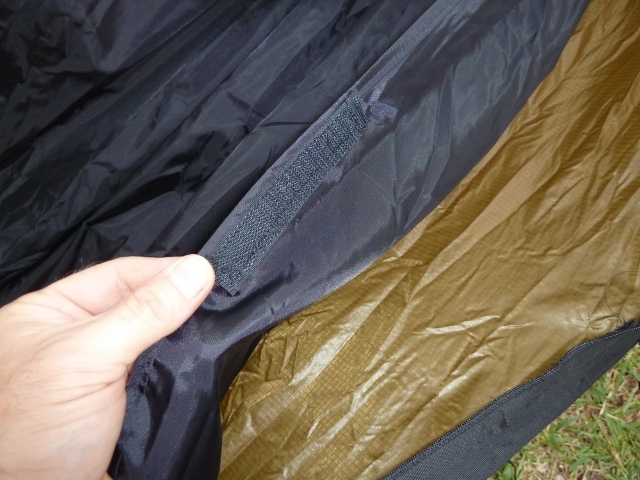 Two pulls are provided for each zipper and have small lines attach inside and out. 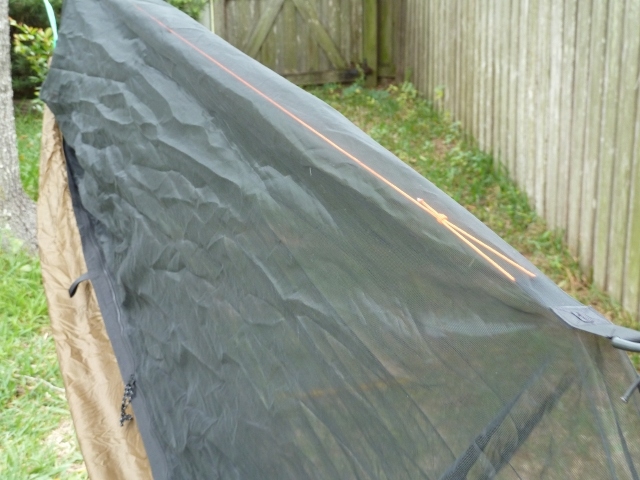 Once unzipped the netting is secured to the non-structural ridgeline (shown here in orange) to keep it out of the way. 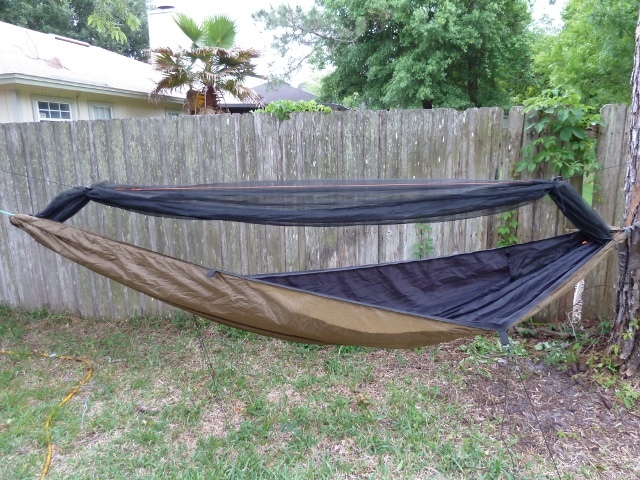 There are four tie-outs on the hammock but for some reason only two have D-rings. I’ll probably pick up some lightweight ones so I have all four covered. If you have wide shoulders it’s not a bad idea to use the tie-outs on either side of your torso to help avoid a potential shoulder squeeze. I didn’t really have that problem but others have made note of it. 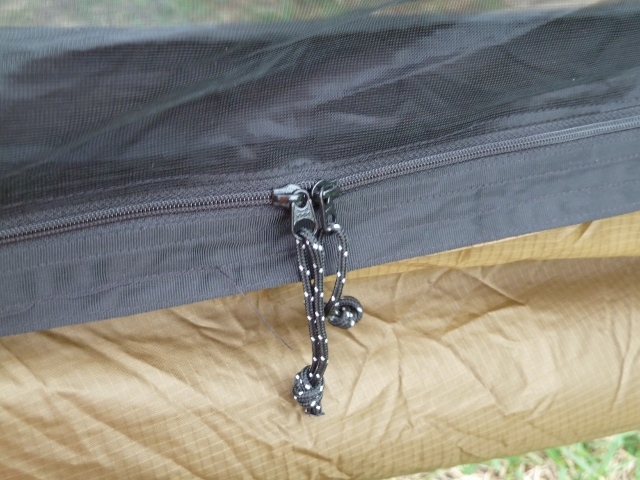 Inside the hammock you’ll find two small gear pouches on opposite ends/sides. There are also ties for holding a gear bag, pillow, etc. The Light Hiker sports a double-layer construction with 1.1 ripstop which allows you to insert a foam pad, space blanket, etc to help protect your backside from the heat-stealing air. The inner layer is secured to the outer with two short strips of Velcro. I wonder if one or two more might be handy as there seems to be some sag with the upper moving away from the lower. We’ll have to see how it works in practice. When you’re ready to breakdown it’s possibly even easier than the incredibly fast setup. Prior to starting the breakdown I lay the ridgeline and tie-out lines lengthwise along the hammock in an effort to keep things tidy. My method is to hold the whoopie on the bishop bag end removing it from the biner. Keeping tension on the hammock you simply begin stuffing the hammock and lines back into the bag until everything is secured. 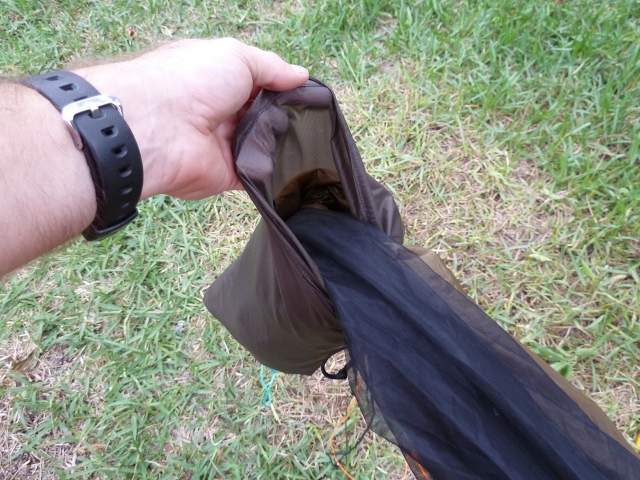 Remove the straps and biners from the tree, fold the straps, and place everything in the bag. 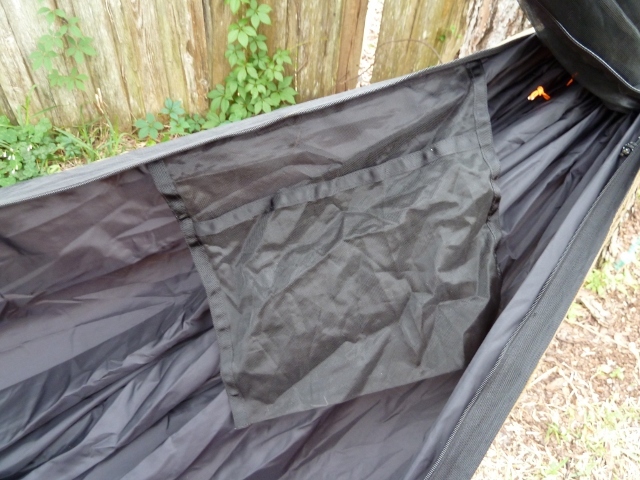 I then lengthen the outer whoopie to provide enough line to make a couple of wraps around the hammock (as shown at the top) just to keep it from dangling. And that’s all she wrote! I’ll be able to get some sleep time in the hammock this weekend but for the little time I’ve had with it I’ve found it to be very comfortable. I think I’m going to be very happy with this new acquisition. Backpacking with the scout troop in the Colorado back country, we see a bunch of different water filters. This is one of the easiest and fastest to use. The inlet line can be easily placed in a small stream, and the float adjusted so it doesn’t sit on the bottom. It isn’t very sensitive to being fully submerged, unlike some other filters. Even the younger boys have no trouble operating this one. You can easily fill up a 1-quart water bottle in less than a minute. It comes with a reasonable carrying bag, although some care must be taken to keep the inlet & outlet lines separate. Parts (e.g., replacement filters) are readily available from a variety of sporting-goods & camping stores. Hey, there. Saw your comments on Hammock Forum. Nice write up. Thanks for taking the time to do this. I’m hunting for my first official hammock and the Switchbacks have grabbed my attention. I know it’s all very subjective, but do you find the diagonal lay restrictive in the LH model? I’m about 6’1″ and 165 lbs and debating between the LH and the classic version because I’m worried that the LH, with a shorter length, may not feel big enough. With that being said, would the numerous tie outs resolve that issue of squeeze on the shoulders? I had a thought for the addition of D rings… I’m not sure exactly how big the D rings are supposed to be, but could you just insert a zip tie instead of a D ring? They’re light weight, can be used in several sizes, and are cheap (you probably have some around the house). Anyway, it’s just a thought (I got that idea from Jason Klass at his blog). I find the lay in the Light Hiker very comfortable. Probably more so than my Explorer Ultralight. I about your height and a tad over your weight and don’t have any problems. I, too, was concerned with the shorter length on the Light Hiker compared to the original Switchback but after using it for a week on the Appalachian Trail I think the Switchback might be just a little long (especially for my tarp). 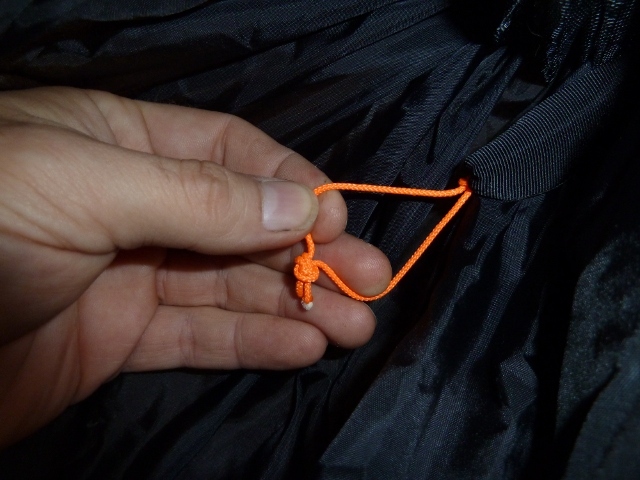 Tying the sides out at the head of the hammock would certainly remove any shoulder squeeze. This hasn’t been an issue for as I’m already used to tying out with the Hennessy. I have no real complaints about the Light Hiker and would certainly recommend it. I’m very pleased with it and it’s my #1 hammock now. I hadn’t thought about the use of zip ties. I like the D-rings since they don’t cause the tie-out to scrunch up and the zip tie might distribute the tension enough. I’d thought about just taking a new D-ring and using the Dremel to cut a small notch in the back to slip the tie-out through. Thanks for the idea, though. Thanks, Kudzu. One last thought I had…what do you feel is the learning curve on hanging the LH? I’m very new to hammocks and am debating Warbonnet models and the Switchbacks. Since the ridgeline on the LH is not a true structural RL, did you find it finicky when searching for a consistently comfortable set up? I’ve read that many users of the LH find a tighter, more taut set up works and if you’re uncomfortable, just tighten up the whoopies. What’s been your experience (though I’m sure it’s different for everyone). I made the adjustment to the whoopie suspension with little difficulty. I’d already dumped the stock suspension on the Hennessy and was using ring buckles so it was a fairly smooth transition. The only real difference is having to tuck the end of the hammock under my arm to release the tension on the whoopie so it’ll adjust. Not really a big deal. 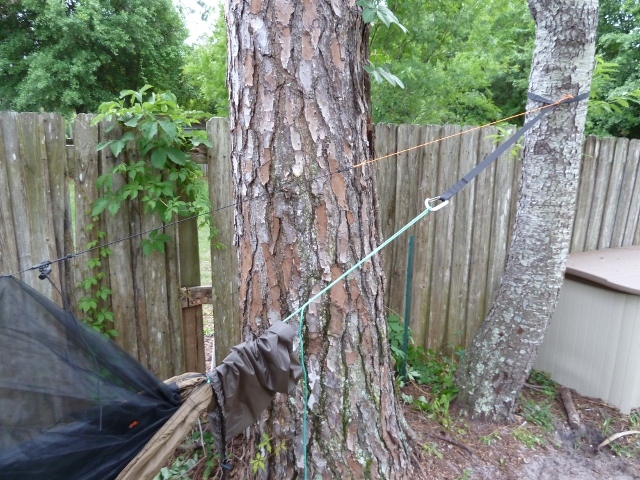 Ok, I ended up with a very taut hammock out of necessity rather than design. Someone snagged my original site and the trees I was left with really had me at the limitation of my suspension even with my extenders. I was close enough to go home and get longer straps but I promised to try the tighter lay and wanted to keep it. I think the end result is that I never want to do it again. I don’t know if it was me or what but even with the sides tied out I felt like a giant taco that had been rolled tight. The shoulder squeeze was bad. Seriously bad. Everything felt very claustrophobic. The netting didn’t seem right. I was hot. All in all, not a good experience. I finally had to make some adjustments to loosen things up as much as I could. Once I did that I fell right to sleep and kept the critters away with my snoring. So for me, tight isn’t good. I’m sorry the tight pitch did not work out for you. At least now you know what’s going to work for you and your hammock. This could just be one of those YMMV issues with the LH. No worries. Better to learn close to home than on the trail! Hey, Kudzu. I opted for the single layer Switchback. I’m very excited. Waiting for it to arrive; might be a couple weeks. Out of curiosity, since the tight pitch didn’t work for your LH, would you say you use the traditional 30* angle set up, or something different? I think you’ll be stoked with the SB. That’s what put me down the path to the LH. As for the angle I’d say start with 30° tip as a guideline but just use it as a starting point. It seems like folks in the forums really get hung up (no pun intended) on the optimal angle. I can honestly say I’ve never once thought about or wondered what angle my suspension was at. I just eyeballed it until it looked right and hopped in to test the theory. After a few times of hanging you’ll figure out what it should look like to make it most comfortable for you.